"Sampath Speaking" - the thoughts of an Insurer from Thiruvallikkeni: Tamil spoken at Edgbaston ,, .. Heather Knight learns Hindi !! Tamil spoken at Edgbaston ,, .. Heather Knight learns Hindi !! There were times when in the gentleman’s game of Cricket, players used to bully, sledge and shout at opponents. There have been some (in)famous sledging incidents too – in between, there have been many chatterers – Kiran More’s loud and continuous ‘sabash, savaash, savaash’ gained attraction those days …. .. There have been many technological improvements in the game – the stump camera, when it was introduced, was revolutionary. It gave fans a whole new perspective of the game. The stump mike picks up many action and makes followers hear many words uttered on field. In one series, Aussies displayed so much objection to stump cameras !! The 1000th test for England is now on at Edgbaston ~ and the 17th over incident at Birmingham has gone viral at least among Tamil fans !! reasons ?? Away in UK, Heather Knight was left with big shoes to fill when she was named England captain in June 2016 following the retirement of Charlotte Edwards. It was, though, a natural progression for Knight who had been Edwards' vice-captain since 2014 and had built captaincy experience with Berkshire in county cricket and Hobart Hurricanes in the WBBL. Knight, a top-order batsman who has latterly developed her offspin into a very handy second string, having initially bowled medium pace before a serious hamstring injury, had become a regular presence in England's top order since making her debut in 2010. The Women's Cricket Super League (WCSL), known as the Kia Super League for sponsorship reasons, is a semi-professional women's cricket competition in England and Wales. The third year of the Kia Super League kicked off last week, with a decent start from the Western Storm girls. Heather who syndicates column wrote : It's great that the amount of games has doubled from last year and chatting to some of the other England girls, it really feels like the standard has gone up another level this year and not just from the international players. There have been some really good performances from some of the younger girls coming through and it's been great to see. Ellie Threlkeld at Lancashire Thunder was impressive last Friday, while Emma Lamb has bowled well up there and Sophia Dunkley at Surrey Stars has also performed well. 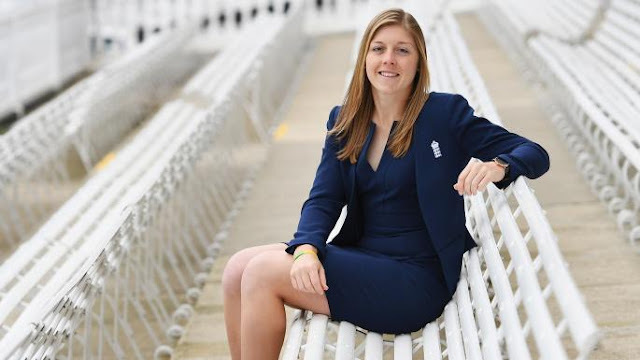 Here is something more interesting – on honing communication and language skills learnt from Heather Knight : - Mandhana's first four innings for Western Storm were 48, 37, 52 not out and 43 not out - a strike rate of 206.89 runs per hundred balls. Down at Storm we've got quite a similar squad to last year but with a new overseas addition in India's Smriti Mandhana. Having never batted with Smriti before, I was in with her from the second ball of our first match against Yorkshire Diamonds. Mid-partnership, she told me she was struggling to call between the wickets in English, which as you can imagine may have been a slight issue, as my Hindi is pretty shady to say the least! - So I asked her to teach me what 'yes' was in Hindi - 'Haan', apparently. Luckily it wasn't needed as she just kept whacking boundaries! Learning a new language out in the middle - one of the unique things about the KSL. At Edgbaston, yesterday, it was over no. 17 – Ravichandran Ashwin had just dismissed Alastair Cook with a beauty – Jennings and Root were playing – keeper Dinesh Karthik shouted to Ashwin ‘nalla irukke’ (well bowled !) then uttered – mama, appadiye podu, moonu balum angeye podu, avan enna pannurannu pakkalam ! (instructing Ashwin to bowl the next balls at the same length and see what the batsman would do !) – some fans became happy for it was Tamil at Birmingham in UK land. We know Karthik speaks Tamil. In Mar 2018 in Srilanka, emulating Dhoni’s talking style, he had a lengthy talk with Washington Sundar in Tamil – urging the bowler to bowl ekking him that the batsman seems not to be picking and he should bowl fuller (that conversation in Tamil was picked up by stump mike ! during the Nidahas trophy ! ).